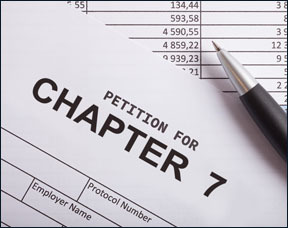 Chapter 7 Bankruptcy, allows people in debt to get a fresh start by having their debts discharged. Most debts are dischargeable. However, there are certain types of debts that cannot be discharged, even through bankruptcy. The purpose of a Chapter 7 Bankruptcy is to allow a person to obtain a fresh start, free from creditors, and free from the pressures of overwhelming debt. Under this Chapter, you may be able to keep your home, vehicle, qualified retirement plans, and other assets. After filing for relief under Chapter 7 Bankruptcy, you may receive a discharge. A discharge permanently prohibits creditors from attempting to collect those debts listed in your bankruptcy petition. A Chapter 7 Bankruptcy takes about four to six months to run from start (when you hire us) to finish ("discharge"). It normally takes only two appointments to have your case ready for filing. Immediately after you file, creditors must cease to harass you. They are not allowed to call or write you without the Court's permission. You are required to attend one hearing about a month after your bankruptcy petition has been filed with the court. The purpose of the hearing is for you to verify, in person, that all the information you provided in your bankruptcy petition was accurate and complete. The hearing is conducted by a bankruptcy trustee who is appointed by the court to review your file. The main job of the trustee is to make sure that you don't have any non-exempt assets which could be sold and used to pay your debts. Contact our firm today for your free Union County bankruptcy evaluation.